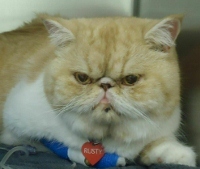 Another Reason to Keep your cat indoors — Rusty’s happy ending story! A few months ago, an owner brought her eight year old Male/Neutered cat named Rusty to see me. A few days prior, Rusty had returned from his usual prowl around the neighbourhood and since then his breathing seemed to be laboured. Radiographs revealed the Rusty’s left chest cavity was very abnormal — likely the result of a car accident or trauma (i.e. being kicked). Rusty needed to see an Internal Medicine Specialist ASAP and I made the referral to the Veterinary Emergency Hospital South. Rusty’s spleen, liver and intestine had herniated into his left chest cavity. Immediate Surgical intervention was needed with no guarantee of the outcome. 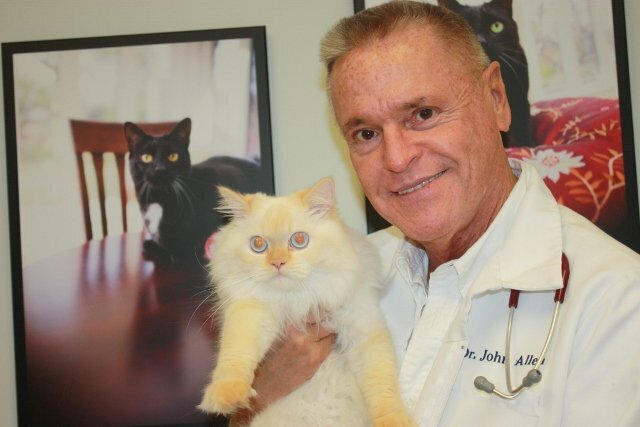 Financial restraints prevented the owner from pursuing the surgery. The only other alternative was humane euthanasia. Rusty’s owners were devastated. The Internal Medicine Specialist called me and we discussed a third option to help Rusty. If the surgery was done at Royal York Animal Hospital there would be more risk than if a board certified surgeon performed it but at least Rusty would have a chance but the cost would be less. Rusty also qualified for RYAH‘s PET FOUNDATION. Our foundation was specifically set up to help owners provide their pets with veterinary care and treatment due to unforeseen and/or extenuating circumstances IN OUR OWN CENTRAL ETOBICOKE COMMUNITY. Each situation is determined based upon the individual owner’s financial needs and the attending veterinary staff’s discretion. This foundation relies on the generosity of RY clients and RY matches any funds received. Rusty’s story has a happy ending…… I took on this surgical challenge and along with the assistance of Maureen and Kim, my two surgical techs that day, we undertook this three hour operation. 3/4 of Rusty’s diaphram was completely torn with only 1/4 of the diaphragmatic circumference unaffected. That is why all his internal organs were in his chest cavity instead of his abdomen! 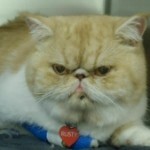 Surgery was successful and two days later Rusty returned home to an elated owner. We hope his roaming days are over! MORAL OF THE STORY! Please keep your cats indoors away from harm’s way!